Sem Stikhiy (1984) - Sci-fi-central.com. Soviet Union  1984  74m   Directed by: Gennadiy Ivanov.  Starring: Hanna Dunowska, Igor Starygin, Irina Alfyorova, Uldis Norenbergs, Aleksandr Filippenko, Boris Khimichev, Lyubov Virolaynen, Aleksandr Vasilyev, Paul Butkevich, Ervin Knausmyuller, Elena Tonunts.  Music by: Eduard Artemev. Olmin leads a project to build a tunnel from Earth to the sun in order to tap its energy. Meanwhile, cosmonauts returning from a dead planet in the Centaurus constellation, bring back stones with mysterious inscriptions and a beautiful "flower" which opens and reveals a mysterious woman named Aria. 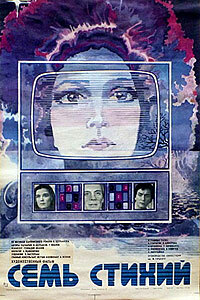 This is a rare to find soviet sci fi film, that was shot shortly before Perestroika days and was hardly ever shown or reviewed. Based on V. Sherbakov's novel of the same name. It deals with new age ideas that the world will be saved by a bright woman named here Aira, who will stop the wars and destruction by means of her humanistic magic and unknown knowelge from outer space. So, the story is rather different from many others sci fi films in the world cinema. The Earth is facing great problems in the nearest future it is in the lack of sun light. The scientist physics Olmin is leading the project to build a special tonnel (made of elementary fractions) from the sun to the earth, in order to the earth could get much more sun energy and light. At the same time a strange flower was brought to the Earth from a dead planet. That flower seems to be alive and unknown and is being observed by a group of scientists carefully. Finally it turns out into a woman, who brings the humans her message about seven elements: ground, water, fire , life, mind and love. And the world is saved. Well, I really liked the music by E. Artemeyev here and the film is although looking cheap is rather interesting to see and think about. It is humanistic and peaceful -no gore , no gloomy characters-just the mystery of discovering of a new life. Although Seven Elements 1984 looks naive and too positive now, it is original and worth exploring, especially for people who believe in new age philosophy. This is the film about the people who build and dicover new world of harmony for everybody. It shows the idea of some people who started to explore natural and scientific knowleges to make living better , so it makes sense for the development of the science in the future. In the 60s both The USA and The USSR used science for army needs first of all, now the world uses science for money-making and some humans' immoratlity, but originally the science was alchemy, that dealt with more sophisticated and important things than modern politics or war business competition, so after all I really liked that ancient idea to be screened in 1984.
Review by andreygrachev from Russian Federation from the Internet Movie Database.